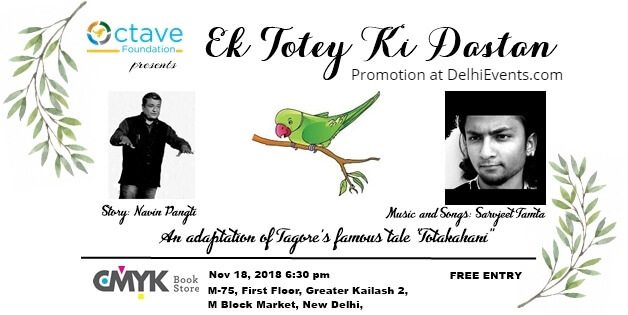 "Ek Totey Ki Dastan" is the tale of a parrot, forcibly getting trained, under the supervision of the state so that it learns to comply with the societal norms. The story is an adaptation of Tagore’s famous tale – Totakahani, first published in 1918 but relevant forever! the narrative also including rendition of three Rabindra sangeet songs, translated into Hindi. though the music has been re-arranged, it carries the elements of the original renditions. Navin Pangti is a designer and artisan who practices farming and engages in writing poetry, prose, storytelling and hand-making artifacts. after post graduating in design from ittb. He lived in the NCR as an independent designer for over 15 years but did not like the ways of the city hence moved to a small a village near Almora, Uttarakhand with his family. he started exploring storytelling when he and his wife Deepti began the homeschooling journey of their children. He has held storytelling sessions at various events like Home-Schoolers meets, learning societies unlearning conference, Kitaboo Festival, festival of places, etc. He has also conducted workshops on relevance and need of storytelling in education for organizations like Azim premji foundation, Pratham science program, diet, etc. Sarvjeet Tamta is a self-taught singer and musician who picked up the instruments very early in his life. While he started his journey with Pahadi folk music, he soon feel in love with Nusrat Fateh Ali Khan and dedicated himself to qawwali. He has his own qawwali group which has performed across various cities. He also engages himself with songs of resistance, theatre music, songs of Kabir, etc. He has composed songs for theatre, web series, music videos, as well as his own performances. apart from music, he loves to sketch and paint. In collaboration with CMYK Bookstore.